October 19, 2018, Adrian, Michigan – Systemic exploitation of the indigenous peoples in the United States began in the late 15th century and continues to this day. That was the disheartening message brought by Sister Susan Gardner, OP, Director of the Native American Apostolate for the Diocese of Gaylord, Michigan, during a presentation on Indigenous Peoples Day, October 8, at the Adrian Dominican Sisters Motherhouse. 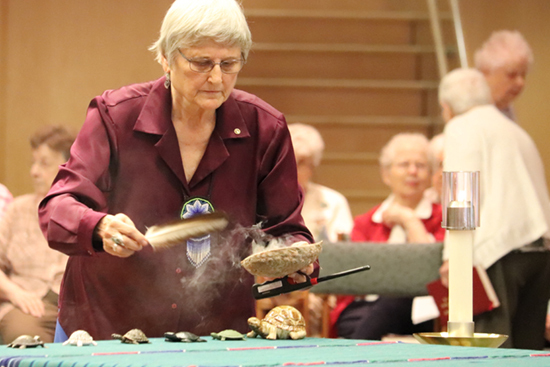 The Congregation’s celebration of Indigenous Peoples Day included a morning Liturgy that recognized the cultures of Native Americans, efforts to bring justice to the indigenous peoples in the Americas, and the ministries of nearly 50 Adrian Dominican Sisters with various tribes of indigenous peoples in the United States and Canada. The Adrian Dominican Sisters join 55 cities and five states in celebrating Indigenous Peoples Day rather than Columbus Day on the second Monday of October, in recognition of the exploitation that many of the European settlers inflicted on the native peoples. In her presentation, Sister Susan focused on two practices that have exploited Native American people through the centuries: the Doctrine of Discovery and boarding schools for Native American children. The Doctrine of Discovery encompasses papal bulls, legal documents, and U.S. Supreme Court rulings that gave European Christians the right to take possession of the lands that had been inhabited for centuries by indigenous peoples. At the time that Columbus arrived in the Americas, Sister Susan said, an estimated 10 million to 100 million people inhabited that land. “They had been living their traditional lives,” she said. “They had been taking care of their land since time immemorial, but since they were non-Christian, the land was deemed null and void,” open to being possessed by European settlers. The Doctrine of Discovery spells out the basic beliefs of the Christian European nations of Spain, Portugal, England, France, and Holland. “Europeans thought that God had directed them to bring civilized ways, education, and religion to the indigenous people, and to exercise paternalism and guardianship over them,” Sister Susan explained. Sister Susan told harrowing stories she had heard while ministering at a healing program in Canada. For example, one woman recalled that, as a young girl, a Catholic Sister placed a bar of soap in her mouth and kept it there for several moments. She was also locked for most of the day in a janitor’s closet – both times because she had waved to one of her siblings at the school. She also recalled evenings when the girls in the school were lined up and the priest tapped selected girls on the back of the head. Those girls were taken to the priest’s room to be abused. Sister Susan also spoke of the boarding schools’ practice of letting non-Native people choose any of the students to adopt – and that child was given to the couple. “The school would build a little casket the size of the child, fill it with rocks, seal it real well, and put a note on it,” warning the parents not to open the casket because the child had died of a contagious disease. The child might not ever be reunited with his or her family. While Native Americans still face injustice, Sister Susan also pointed to ways in which the government and individual U.S. citizens are working to right some of the many injustices. Native Americans were given U.S. citizenship in 1942 and the right to vote in 1948, she said. The Indian Religious Freedom Act, passed in 1978, was repealed in 1990 and then again put in force in 1994. Most recently, in 2008, Congress passed a bill designating the day after Thanksgiving as National Native American Day – though many see it as Black Friday, a day for Christmas shopping. “It’s a small step in the willingness to balance the misleading narrative of discovery and to recognize the true Native American history of thriving economies and a sophisticated system of government, which existed long before our ancestors came to this land,” Sister Susan said. Feature photo: Sisters and guests at Sister Susan Gardner’s presentation on Indigenous Peoples Day listen as Sister Esther Kennedy, OP, poses a question. October 11, 2018 Adrian, Michigan – Adrian Dominican Sisters and their special guests – Native Americans from the local area – celebrated unity and “oneness of heart” between indigenous peoples and the descendants of predominantly European immigrants on October 8 during a Liturgy marking Indigenous Peoples Day. With this Liturgy, the Adrian Dominican Sisters and their guests joined 55 cities and five states that celebrate Indigenous Peoples Day rather than Columbus Day on the second Monday of October. The liturgy reflected a spirit of joy and unity. After a welcome by Sister Susan Gardner, OP, Director of the Native American Apostolate for the Diocese of Gaylord, Michigan, the names of six Adrian Dominican Sisters with Native blood and more than 50 Sisters and one Associate who have ministered with Native Americans in the United States and First Nations people in Canada were read. The liturgy also incorporated key elements of Native American spirituality. To the beat of Native American drums, Native guests and the Sisters who ministered with Native Americans and First Nations people processed into St. Catherine Chapel, following the cross carried by Sister Kathleen and the Eagle Staff – which can be carried only by combat veterans – carried by Art Robertson. Sister Mary Rae Waller, OP – a chaplain with the retired Sisters at the Dominican Life Center who has some Cherokee blood and who has ministered with Native Americans – prepared to smudge the Sisters and Native people in the procession. Similar to incense, smudging is a ritual that brings blessing and healing. Left: Sister Mary Rae Waller, OP, prepares to smudge the assembly, an act of blessing and healing. Right: Sister Maurine Barzantni, OP, accepts the smudging from Sister Mary Rae Waller. The readings focused on right relationships among people. The first reading, read by Sister Tarianne DeYonker, OP, was an excerpt from an 1805 address by Chief Red Jacket of the Seneca Nation, imploring the white settlers of New York to respect the Native religions. Noting the challenge of the readings for people to “live in right relationship” with one another, Sister Mary Rae said that people have been slow to learn that lesson but that there are signs that people are beginning to listen. She spoke of manifestations of “deeper communities of the spirit” among descendants of European immigrants and Native American people. “This manifestation overcomes the historical, racial inaccuracy embedded deeply in the fabric of American legal life and implicitly imposed within spiritual formation and human potential,” Sister Mary Rae said. These inaccuracies and prejudices were enshrined in the Doctrine of Discovery, principles of law articulated in the late 15th century but still used as precedent today that gave Christian European settlers the “right” to conquer lands in the Americas held by non-Christian natives. But Sister Mary Rae focused on the transformation of understanding of many Americans. Jesus’ prayer in the Gospel from John read during the liturgy – that “all might be one” – is being answered today in part by Sisters who have ministered with Native American peoples. The Native American spirit continued to be manifested throughout the liturgy. During the prayer of consecration – and particularly when the bread and wine were transformed into the Body and Blood of Jesus – the drums continued beating, adding a unique sense of reverence to the prayer. At the close of the liturgy, Sister Susan and Sister Marilee Ewing, OP – members of the planning committee along with Sisters Kathleen and Mary Rae – were presented with Native blankets in appreciation for their efforts to bring the communities together in worship. In turn, Father James Hug, SJ, presider, thanked the Native guests for enhancing the celebration of the Eucharist. “You have truly helped us pray today in a deeper and more reverent way, and we thank you,” he said. 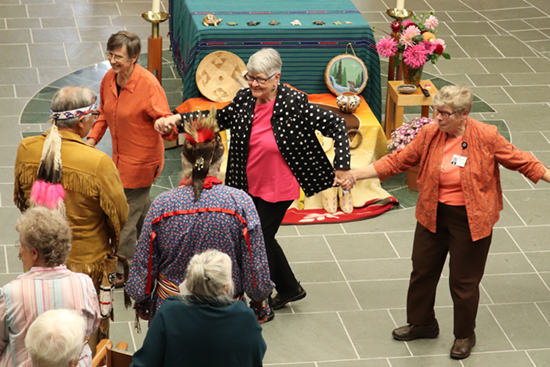 As the assembly processed from St. Catherine Chapel to the sound of drums, the joy of the experience continued as Sisters and guests spontaneously began a joyful circle dance around the chapel. 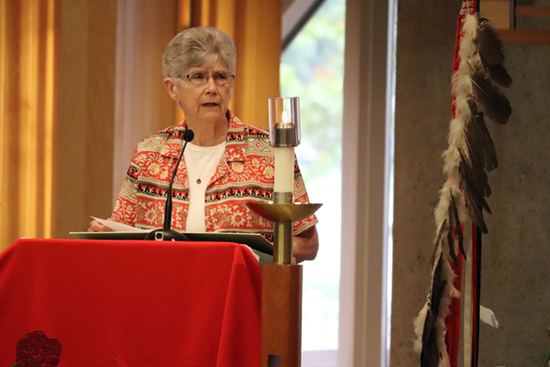 Participants at an afternoon session by Sister Susan, however, were reminded that the people of the United States and Canada still have a long way to go in accepting their Native sisters and brothers. Sister Sue spoke on the effects of the Doctrine of Discovery and of the boarding schools in the United States and Canada that attempted to force Native children to conform to the mainstream culture. 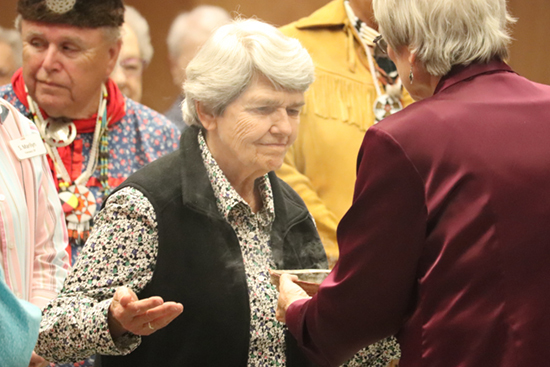 Sister Tarianne DeYonker, OP, proclaims the words that Seneca Tribe Chief Red Jacket delivered at a 19th century council to discern the value of choosing one faith over another. From left, Sisters Suzanne Schreiber, OP, Esther Kennedy, OP, and Mary Jane Lubinski, OP, participate in a spontaneous, joyful circle dance around St. Catherine Chapel at the close of the Liturgy. Feature photo at top: Sister Kathleen Nolan, OP, and Art Robertson lead the procession out of St. Catherine Chapel at the end of the October 8 Indigenous Peoples Day Mass, followed by, from left, Sister Mary Rae Waller, OP; Father James Hug, SJ; and Sister Marilyn Winter, OP. Mr. Robertson carries the Eagle Staff, which can only be carried by a combat veteran.